• Some tumor types are associated with specific chromosomal abnormalities. • Incidence is increased in certain inherited diseases (e.g., neurofibromatosis, tuberous sclerosis). • Most cases are idiopathic. • Specific chromosomal abnormalities and prior cranial irradiation are sometimes implicated. CSF cytology may yield histologic diagnosis. A neuroradiologist is able to diagnose tumor type with considerable accuracy, but all tumors should be biopsied for 100% accuracy. The biopsy should be subjected to histochemical analysis. MRI with contrast is highly sensitive. CT scan is useful if calcification or hemorrhage suspected. • Surgical removal or debulking usually required. If the tumor is of a benign nature (e.g., meningioma, acoustic neuroma), no further therapy is usually required. • Radiation is useful for certain types of tumors. Steroids (e.g., dexamethasone 4 mg PO q6h) may be used as a temporizing measure to reduce edema. All cases warrant evaluation by an oncologist. 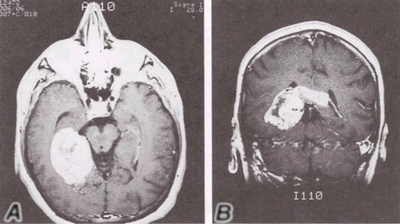 Brain neoplasms are primary (nonmetastatic) tumors arising from one of many intracranial cellular substrates. Specific tumors and prognosis are listed under other headings. Although brain tumors are not always malignant-a condition that spreads and becomes potentially lethal-these growths are always serious because they can cause pressure in the brain and compression of nearby structures, interfering with normal brain activity. Primary brain tumors arise within the brain while secondary brain tumors spread from other parts of the body through the bloodstream. For tumors starting in the brain, about 60 percent of which are malignant, the cause is unknown. Tumors that begin as cancer elsewhere and spread to the brain are always malignant. The incidence of primary brain tumors is about 12 per 100,000 population. About 36,000 new cases occur in the United States annually. Because of di≈culties diagnosing and classifying brain tumors, exact statistics on secondary tumors are unknown. Symptoms vary according to location and size. 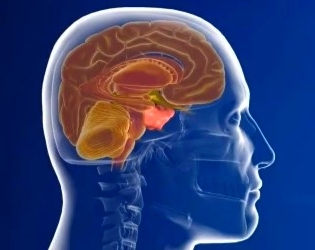 The compression of brain tissue or nerve tracts, as well as expansion of the tumor, can cause symptoms such as seizures, headaches, muscle weakness, loss of vision or other sensory problems and speech di≈culties. An expanding tumor can increase pressure within the skull, causing headache, vomiting, visual disturbances and impaired mental functioning. Brain tumors are diagnosed with MRI and CT scanning. Surgery is a common treatment if the tumor is accessible and vital structures will not be disturbed. Radiation is used to stop a tumor’s growth or cause it to shrink. Chemotherapy destroys tumor cells that may remain after surgery and radiation. Steroid drugs relieve swelling and other symptoms. Figure 65 Glioblastoma multiforme. Axial, A, and coronal, B, postcontrast enhanced T1-weighted image showing a large homogeneously contrast-enhancing mass in the right medial temporal lobe with extension across the midline.